In less than a week one blog post has become the rallying cry of thousands of dog owners whose dogs, for whatever reason, need space. Jessica Dolce’s brilliant and witty My Dog is Friendly! 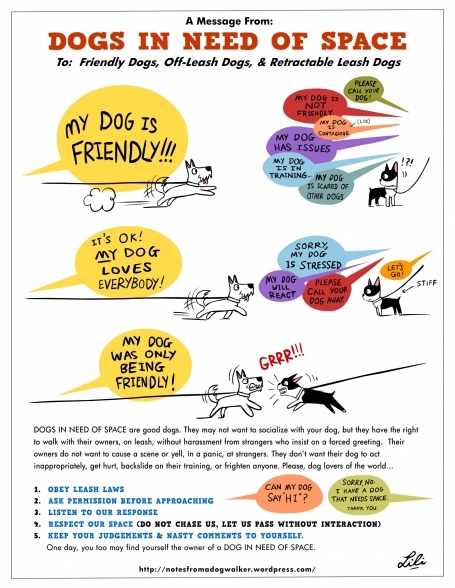 A Public Service Announcement clearly struck a chord with those (like myself) who have had to fend off, run from or argue with inconsiderate owners who feel that their “friendly” dog has the right to “say hello” to every other dog, regardless of how unwelcome that approach may be. A Facebook group followed and, in days, has become a magnet for DINOS (Dogs In Need Of Space) around the world. Graphic posters and a DINOS manifesto have been produced. This is clearly a movement whose time has come! When I shared the original post on my Facebook and Twitter streams, among the many “Amens” reverberating from DINOS-owning friends, there were questions from people, who I know to be considerate and responsible owners of friendly dogs, wanting to understand better how to respond when they meet a DINOS. The DINOS manifesto addresses this for on-lead dogs, but here in the UK, things are complicated by the fact that we don’t have “leash laws” as such. Dogs must be “under control” in public but not on a lead – except in council designated areas. Most (but not all) owners have their dogs on leads beside roads but in many public parks, common land, forest trails, beaches and open space, dogs are allowed to run free. This is great for dogs that are sociable but makes life even tougher for DINOS and makes things less straightforward for responsible folk with friendly dogs to decide how to proceed. If the other dog is off lead, for instance, should they assume it is not a DINOS and that their dog can go and say hello? Many felt that being off lead was a sign that it was OK to let their own dog approach. This raises an important question for those of us with DINOS – should they always be on lead in public? Of course this depends on the individual dog, its level of training and the context. Very reactive or fearful dogs may need to be on lead permanently for their own safety and that of others. But what of dogs that are happy to ignore other dogs if left alone? Or those in training who don’t want to be distracted? Or the elderly or frail who just want to potter with their owners? Surely they have the right to be off lead if under control? Someone suggested “dog walking etiquette” should be taught in basic puppy classes – and I think this is a great idea. But what might it look like? Here’s my suggestion for a simple dog walking etiquette to apply to all of us, whether DINOS, MDIFs (My Dog Is Friendly) or anything in between. Don’t let your dog approach. Even if both are friendly, it is an unequal meeting and not fair to the on-lead dog. There is usually a reason the dog is on a lead: respect this, give space and move on. Ask permission first and wait for the answer. Even if the owner says it is OK, be careful: being on leads adds extra tension to any meeting. If the answer is no, respect this, give space and move on quickly and quietly. See DINOS manifesto for more details. Ask permission for your dog to meet the other and then apply same rules as 2. Are there any obvious resources (toys, balls) that could cause friction? Yes? Then avoid potential conflict and move on. Is the owner training the dog or playing with the dog? Yes? Then leave them in peace to enjoy their time together. Is the dog reasonably matched to yours in age, mobility, size? Yes? Then it might make a suitable play mate – move closer and apply 3a. Walk close – stay by your side on or off lead whatever the distractions. Chase recall – call back your dog even if he has already decided he wants to say hi to the other (also useful when you come across livestock or wildlife). Emergency down – stop your dog wherever he is when you see another dog coming. Directional send away – great for teaching “full on” dogs to approach another more politely. 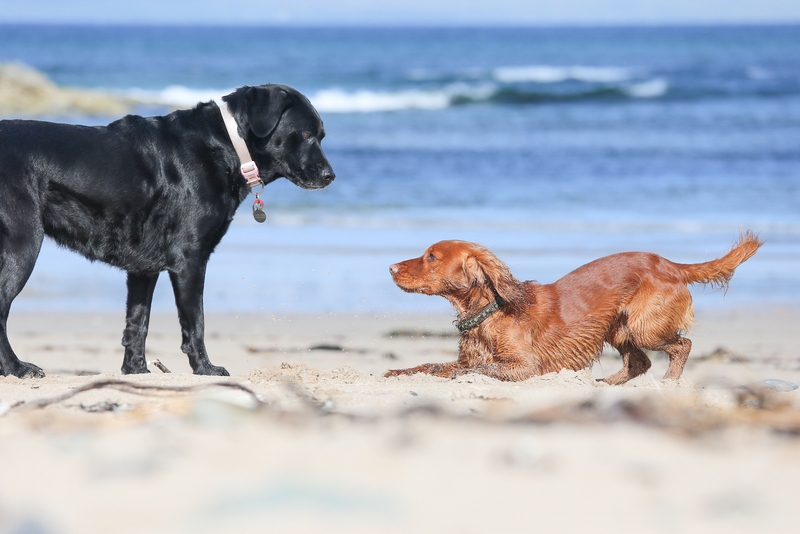 Play bow – teach your dog to invite rather than intrude. What do you think? What would you include in dog walking etiquette? And what behaviours should we all aim to teach our dogs to ensure they are truly “under control” off lead? I’d be interested in your thoughts. ARCHIVE POST: The original Canine Confidence blog was active from 2011-2014. In April 2016 I resurrected it here but there were posts in the original blog that are still relevant. Rather than repost as new material, I am including them here as Archive Posts, along with the original publication date. This avoids the need to edit to remove references to time for instance. Each archived post will include a PDF of the original comments, where appropriate, as in some cases these include additional clarification of the post. This post was first published on Canine Confidence on 6/12/2011. Archive of comments from original posting.